So pings are a bit lower, on average, than either AT&T or Sprint. They’re also rather predictable, unlike those of CricKet. Then again, I have full EvDO signal sitting at the dining room table with the USB727’s antenna extended. For what it’s worth, this traceroute is pretty close, after the MyVZW hops, to what I see on the family’s brand-spanking-new DSL connection, though that can be expected since both services are from the same company. Well gosh, at least at my location Verizon is nearly as fast as AT&T on the downstream, respectable on the upstream and a good bit more enjoyable to use than AT&T. 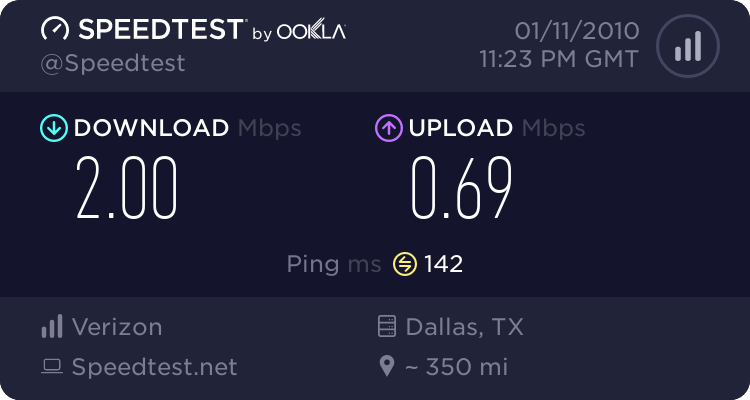 Heck, the EvDO connection soundly beats the new Verizon DSL, though the DSL connection doesn’t cost $60 per month, nor does it have a ridiculously low data transfer cap. Still respectable, just not quite as nice. Right in line with what I’ve seen on Sprint EvDO, except with a little less latency. The bottom line: Verizon knows how to run a solid mobile broadband network. So does Sprint. Whether one serves you better than the other depends on who has the big pipes to the towers in your area, and who has the towers in your area period. Well, and there’s the question of whether you want a 10GB cap for $60 or unlimited service for $70, both via Millenicom of course…unless you really, really want to sign a contract in exchange for a free EvDO modem. Which provider would I choose at this point, if I had to pick up mobile broadband again? Tough decision; I own an AT&T aircard and don’t want to sign a contract, so the other options have an added expensve for me. With that in mind, I might end up going with AT&T for a month or two, but Sprint if I needed a home replacement connection. If I didn’t need to use the connection as my only internet and didn’t have an AT&T card already, I’d likely choose Verizon, with Sprint as a very close second. 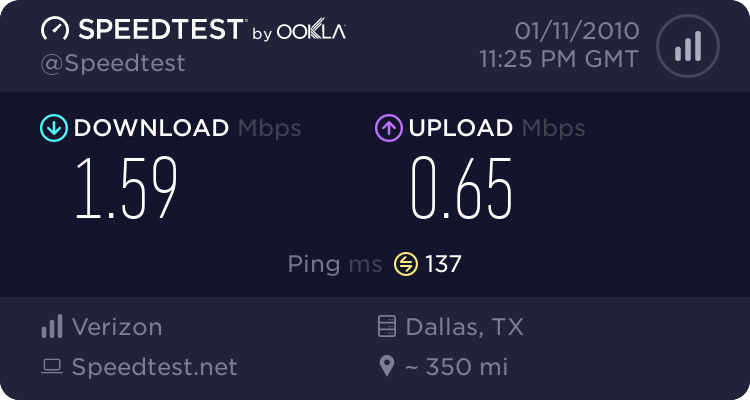 At this point though, for someone new to mobile broadband, there’s one company I wouldn’t recommend anyone to go with, at least for my area: AT&T. This entry was posted on January 11, 2010, 4:37 pm and is filed under General. You can follow any responses to this entry through RSS 2.0. You can leave a response, or trackback from your own site.